Manufactured to the highest standards for quality, safety and performance, Tuttnauer's HSG Economic line of fast, mobile, heavy-duty autoclaves is trusted by ambulatory clinics and operating rooms all over the world. 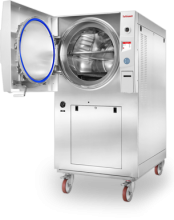 The HSG Economic Line includes 85 liter and 160 liter single door autoclaves. The Economic Line is ideal for most medical centers that need hospital grade sterilization and infection control without large autoclaves. Designed to be economical high performance autoclaves that offer substantial loading capacity and mobility in one easy to connect device. These steam autoclaves operate at high sterility assurance levels while providing the cycle flexibility needed for processing a wide range of products. Like all other Tuttnauer autoclaves the Economic Line is built to meet the strictest international standards and directives, and has essential safety features.